I have been on the hunt for an LED light on a headband for running at night. I saw one on somebody’s gratitude blog…why don’t I ever remember where I see these things? If it was you, please tell me in the comments 🙂 The running shop near my house is out of them. So I looked at Target and they didn’t have them. But they did have this. A really cool reflective running/walking/biking vest. Obviously I have no pride, so I am thrilled to have this to wear when I run at night and when we go for our family walks after dinner now that the time has changed and it gets dark so early. I felt very safe on our walk tonight. 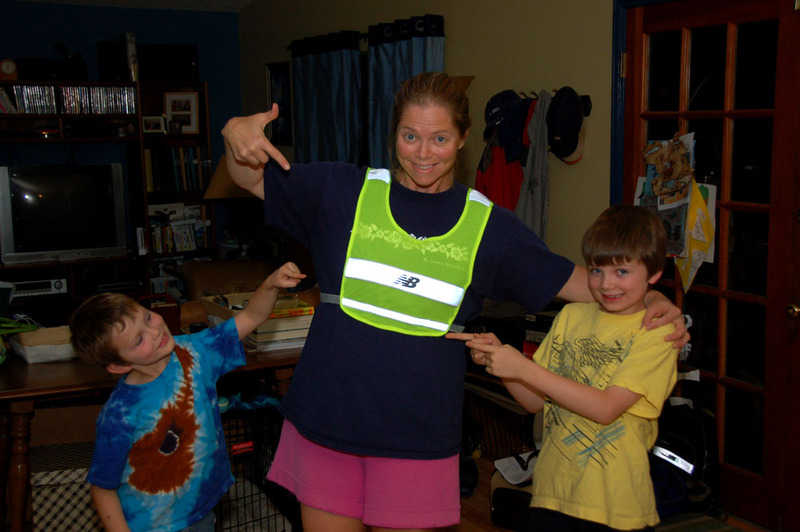 I am grateful for my goofy reflective vest. This entry was posted on November 16, 2010 by Caroline Calcote. It was filed under Uncategorized . Lowes/HomeDepot has those headbands, I bought one for when I go walking/hiking in the wee-hours of the morning. I also found this link very useful also…. I got the idea to do this "gratitude" blog from Krissie (Krissie Is Thankful above). She's got lots of other people on board. I started October 1st, but you can start anytime. Consider it! It makes you look at things throughout your day in a more thoughtful way. If you decide to join in, let me know so I can add you to my blogroll.